The Fairmont Vancouver Airport hotel is located within the Vancouver International Airport building. You can choose to either take public transit in (via Canadaline by Translink) or drive, the Fairmont Vancouver Airport offers a 2 hour parking voucher for afternoon tea guests, which is a lovely bonus. 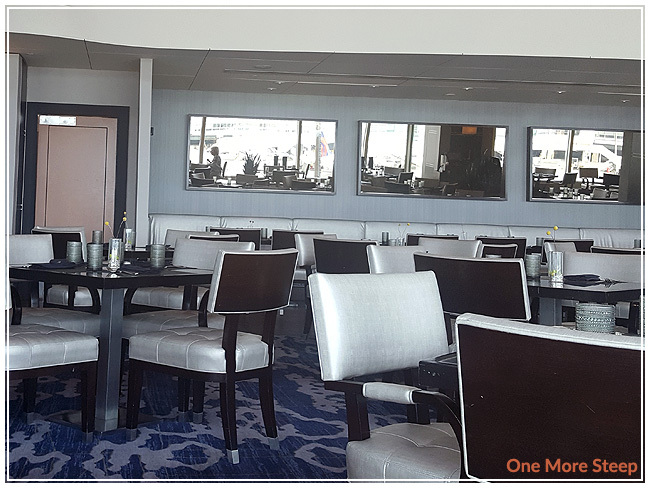 They do have set seating times for the afternoon tea, and require reservations, so it isn’t a trip that you can just plan spur of the moment and expect a table. 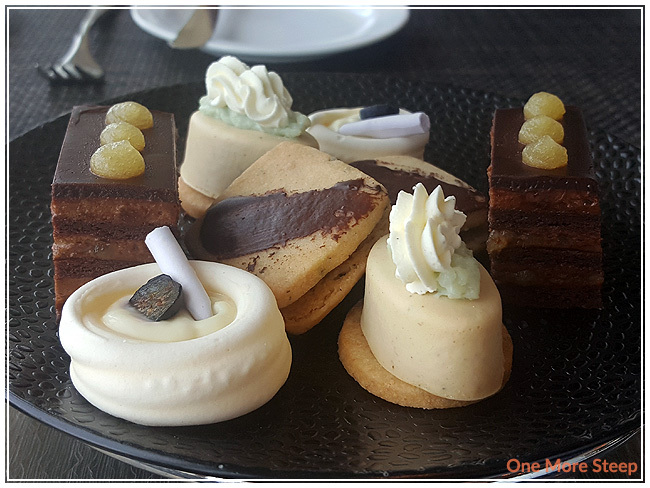 I went for afternoon tea at the Fairmont Vancouver Airport with my sister, we arrived at our 2pm seating on time and were very promptly seated. Our server’s name was Curtis and he was fantastic in terms of talking to us about what was on the menu (and on the three-tier stand), as well as describing the teas. We were seated by the window, facing planes. 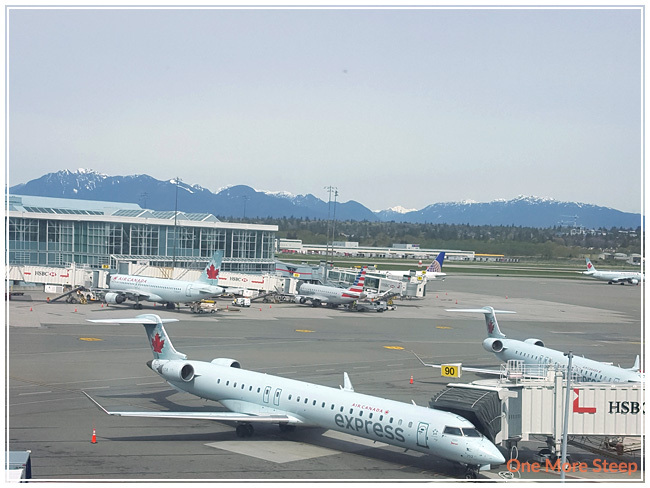 We could see mountains in the background, and Air Canada planes in the foreground – just a beautiful, modern setting to have afternoon tea with. My sister chose the Ceremonial Dragonwell Vixing (a green tea) for her tea. I opted for the Fairmont Vancouver Airport “Jetsetter” (black tea), which was described on the menu as being their “signature tea – low caffeine blend, specifically designed to aid in jetlag recovery, slightly astringent and malty.” There were eight teas on the menu, plus optional premium options with an up charge for premium teas (+$3 or $5) or an Ontario ice wine (+$5). 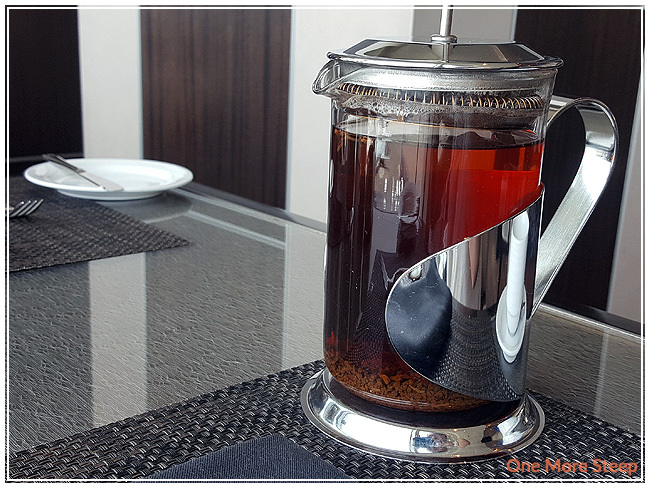 The teas came each in their own French press. The tables already had a little container that had sugar alternatives, white sugar, and raw sugar packets. I got a small container of milk for my tea as well. I tried it both plain and with the milk and raw sugar. 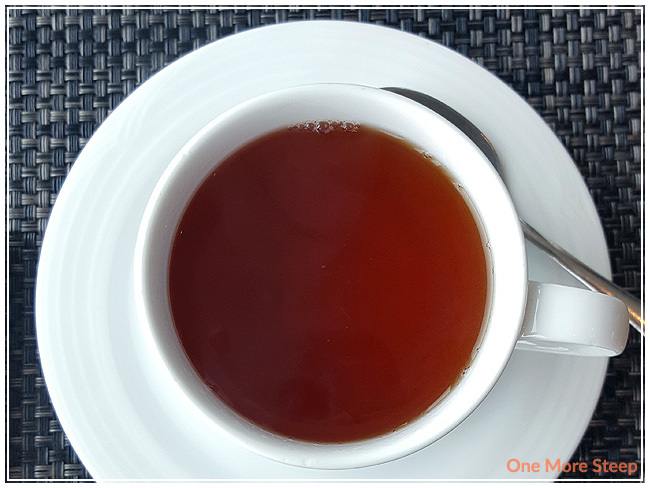 I found it to be quite a tasty black tea – there was definitely some astringency and malty notes to it, I think it’s quite similar to a breakfast tea, except it lacked the boldness that I find commonly in breakfast teas – probably for the best since it’s supposed to help you with jetlag recovery and not keep you awake! 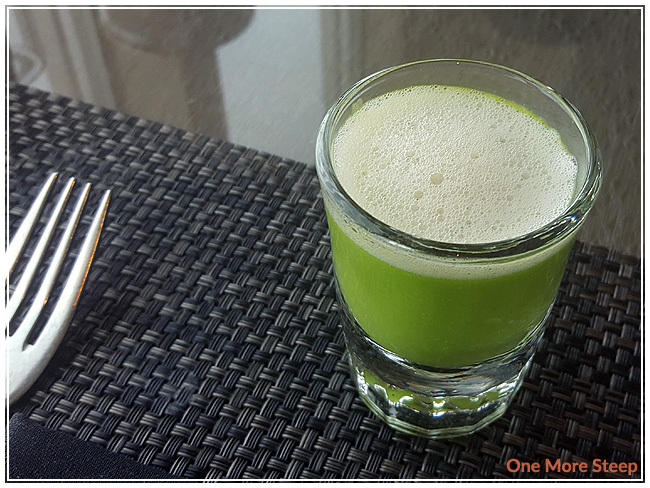 The first thing to arrive to our table was a Spring Pea Soup in a little shot glass, this was on the menu as a “Hot Treat”. There was a truffle parmesan foam on top. As odd as it might sound (pea soup in a shot glass), it was really tasty. There was something almost garlic-tasting in the soup, but it was delicious and a nice treat to have while waiting for the main event. The three tiers of this plate stand started with scones at the top, followed by sandwiches, and lastly desserts. I’m quite used to working my way up, and this place had me going top to bottom – I managed just fine though. 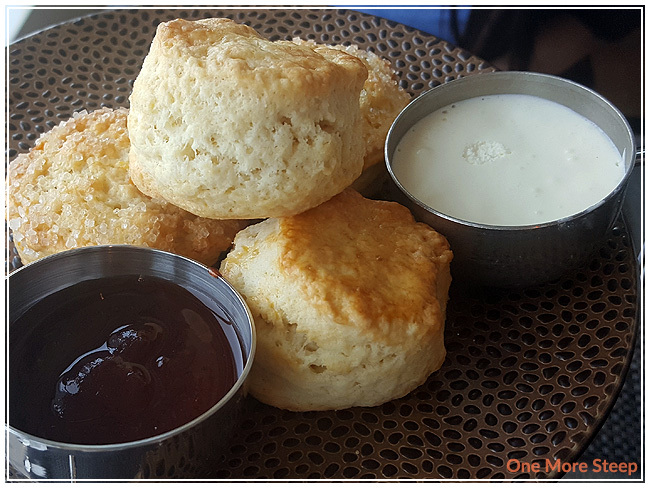 The scones were the Sweet Butter Scone and the Apricot Rosemary Scone, with a devonshire cream and jam. The cream was amazingly thick, the jam was sweet (if I recall correctly, it was an apple preserve). 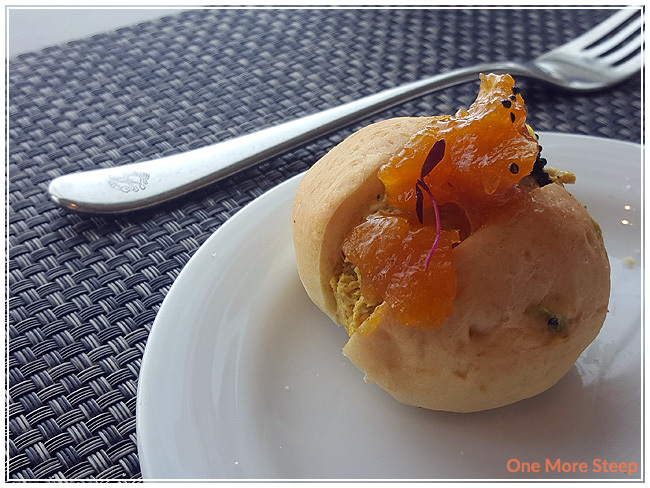 The Apricot Rosemary Scone is the one that had a sugared top, and I found it to be quite savoury with the rosemary, but the apricot flavour wasn’t as strong as I would have liked for it to be. The Sweet Butter Scone was delicious, and was particularly good with the devonshire cream and jam. The middle layer, the sandwiches, had such a variety! 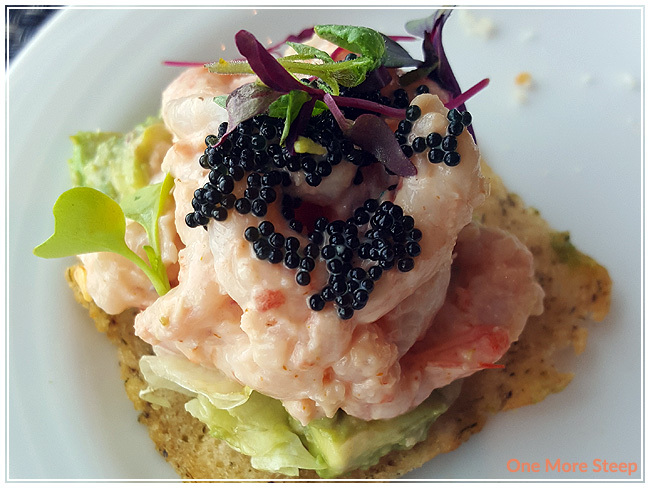 There were four in total, the Sidestripe Shrimp Louie (with avocado, iceberg lettuce, and caviar) was divine. I don’t eat caviar on a regular basis, but it definitely made the meal quite special! 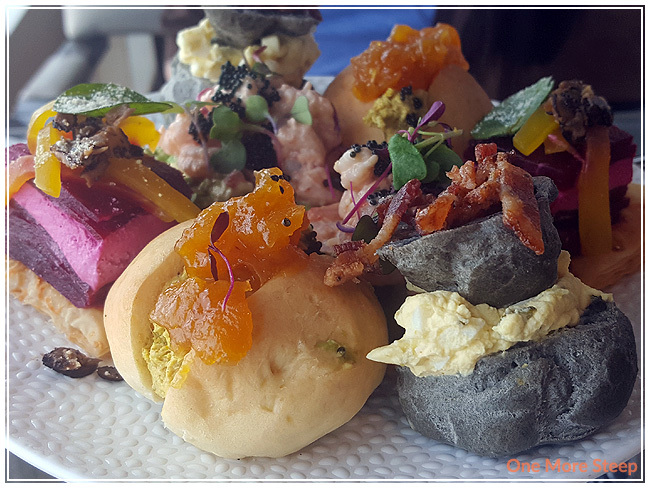 The Devilled Egg Salad was fascinating as it was on a charcoal profiterole, with maple pepper bacon. It was kind of off-putting to be biting into grey food, but honestly you can’t taste the charcoal (as far as I could tell! ), so it was primarily aesthetics as far as I could tell. I kind of wish that there was less of the profiterole and more of the egg salad, as my last two bites were just of the profiterole. The Coronation Chicken, which included preserved apricot and caraway brioche, was a surprise. There was this bright curry flavour that was just enough to make itself known, but not so much that it was spicy. It made for a fun flavour surprise that I really enjoyed. 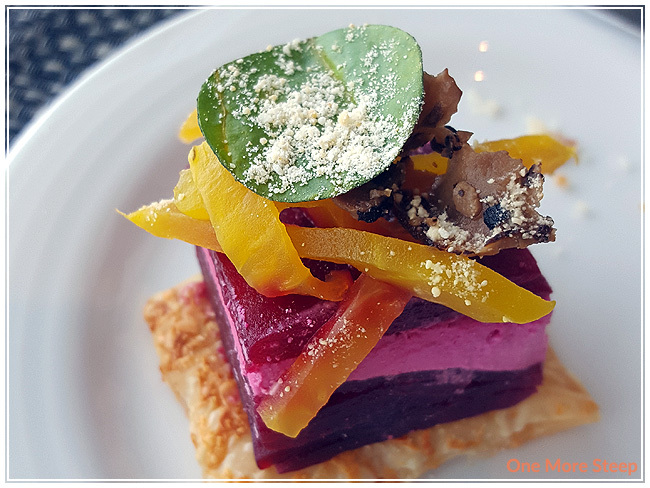 Last, but not least, of the sandwiches was the Beet Mosaic, which included goat cheese, phyllo, and beet shoots. This one was a bit tricky to eat. It was definitely too big to eat all the layers at once, I wound up eat the first couple layers by itself before being able to take it all in. The goat cheese added a nice level of creaminess, while the beets were just rather refreshing. The last (bottom) tier of the afternoon tea was the desserts! I do love saving the best for last. 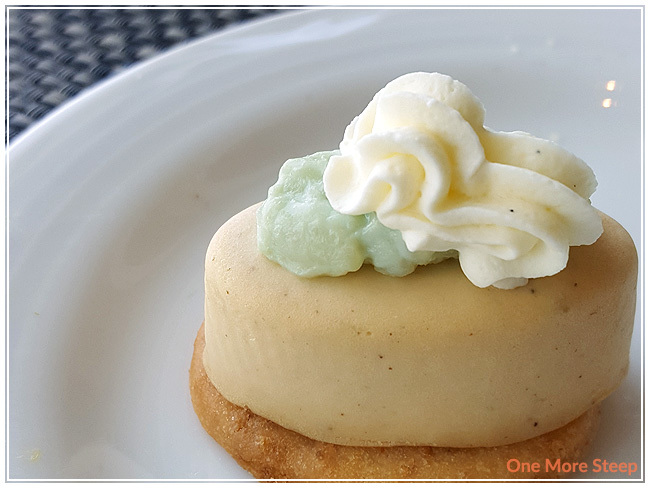 There was a Milk Tea Cheesecake, which had a dollop of jade rice pudding – such a creamy bite of rich cheesecake! The Lot35 Earl Grey Shortbread Cookie Sandwich had an orange chocolate ganache in the middle. I could definitely taste the Earl Grey in the shortbread cookies, and the chocolate ganache was a decadent touch (although, truth be told, the orange was a bit lost in there). 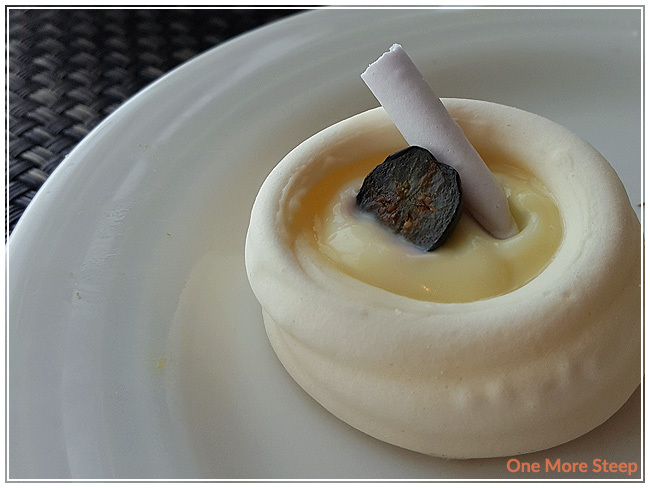 There was a Lavender Meringue, which was like a little pavlova, with a lemon posset and preserved blueberries. This one was really good, with the lemon flavour and the lavender made it so floral. The actual meringue itself was very sweet, but the tang from the lemon really helped with tempering the sweet of the meringue, so it made for a balanced dessert. Lastly was the Ginger Chocolate Cake with a pineapple gelee. I could probably talk about this chocolate cake forever. I could smell the ginger, I could taste ginger and there was a bit of heat from the ginger in the chocolate cake itself, but it wasn’t overwhelming. It was just a very rich piece of chocolate cake that made me so happy that I was eating it. 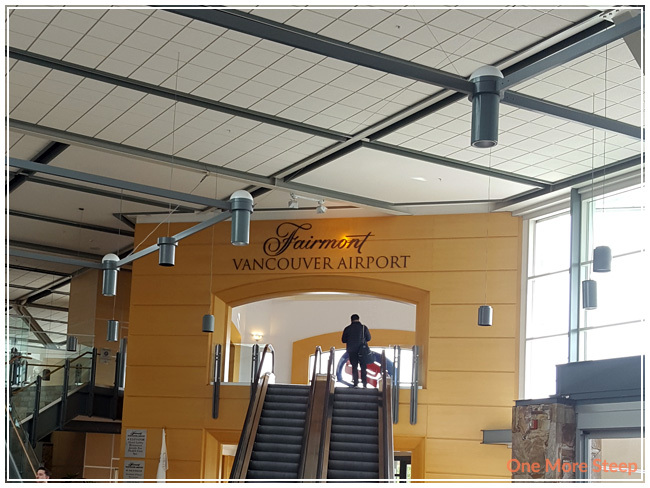 I had a wonderful time at the Fairmont Vancouver Airport with my sister. Again, our server Curtis was amazing and attentive throughout our time there. 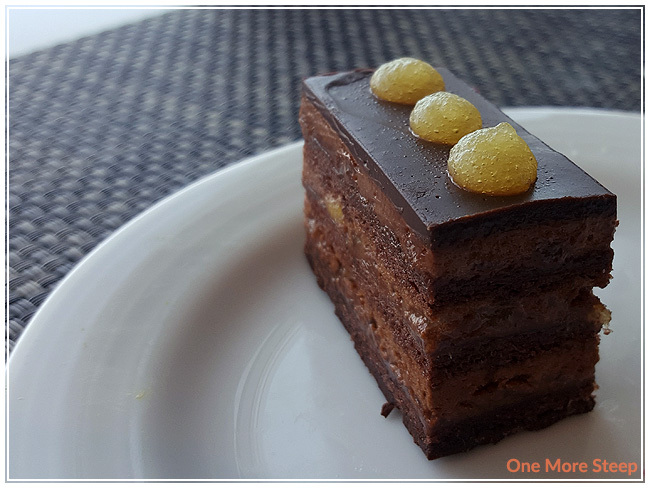 The food is amazing – I’d love to go back there and eat all the things again – especially that Milk Tea Cheesecake… and the Coronation Chicken… And the Ginger Chocolate Cake. I’d probably try a different tea if I were to go back, just to try out some of the other options that they have. The parking voucher was a nice touch (covered $17 in parking fees so we didn’t have to pay for parking! ), and the presentation (and flavour!) was just top-notch. 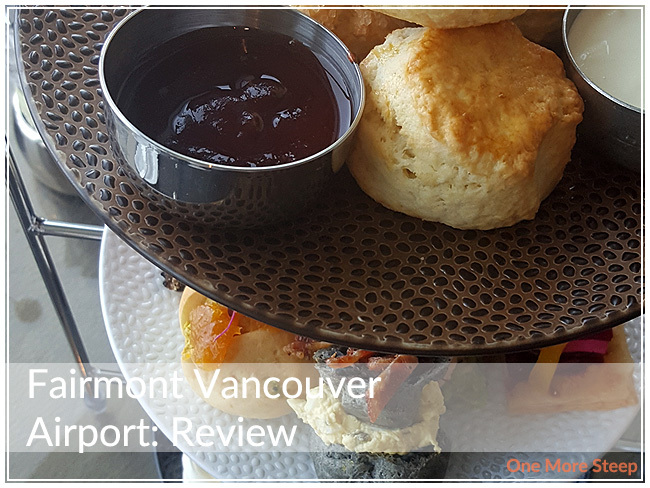 Where the Fairmont Vancouver Hotel’s afternoon tea was very classic, I would say that the Fairmont Vancouver Airport’s afternoon tea is very modern – and quite fitting for it’s decor and location.